Microsoft Power BI, Dashboards, Big Data, Data Scientists, we have all heard these catch phrases over the past few years, but exactly what are they, what do they mean, and how can your company benefit by using them? When it comes to Big Data it is imperative to have real-time, actionable data, and Microsoft’s Business Intelligence is about providing meaningful and insightful data. 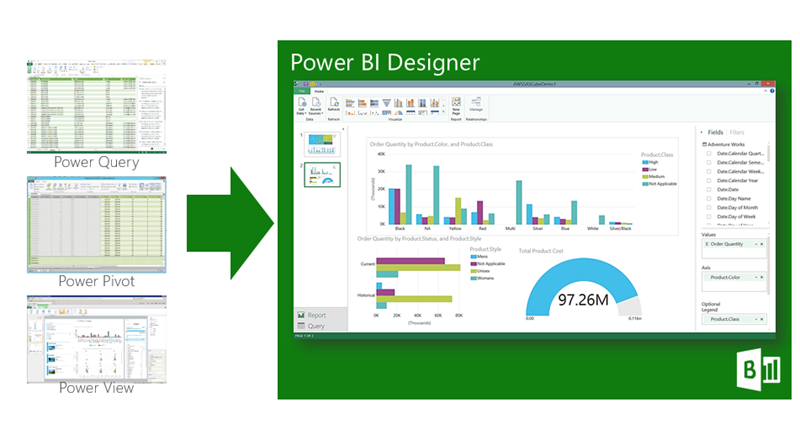 The most recent version of Microsoft Power BI truly leverages the ability to assimilate, analyze and summarize data. What is Microsoft’s Take on “Business Intelligence”? What kinds of people tend to purchase your products or seek out your services? How much does your business’s income vary month to month? What does the graph of your company’s sales look like? How successful was your last marketing campaign, really? If you want simple, accurate, and easily visualized answers to these questions and more, Microsoft Power BI can help. BI stands for “Business Intelligence,” and it’s an apt name for this service. After all, “knowledge is power,” and the more you know about your business, the better you can run it. At Excel Consultant, we help our clients leverage the immense potential of Power BI to their advantage. In the following blog, we describe this fantastic new Microsoft capability and explain how it could benefit your organization. Fundamentally, BI is a method of business analytics: computerized methods of pulling apart and putting back together your key data to help you better understand it. In an increasingly digitized global marketplace, tracking your statistics and demographics can seem daunting, but it doesn’t have to be. Some business owners might shy away from BI because it seems too complicated, thinking it must only be the purview of major corporations with massive data sets. However, especially with Microsoft’s latest programs, BI can help companies of all sizes operate smarter. One of Microsoft’s latest releases in the field of business analytics is Power BI. Like most Microsoft magic, it incorporates an entire suite of programs and a wide range of functionalities. Essentially, it updates existing BI software to provide a more intuitive interface, integrate commonly used business applications, create beautiful interactive data visualizations, and allow users to access their analytics from anywhere. This new generation of BI is as easy to use as it is useful, as aesthetic as it is accurate, and as flexible as it is fruitful. The ultimate purpose of all Microsoft programs is to help your office operate better, providing computerized solutions to your day-to-day problems so you can focus on expanding your enterprise. Take a look at the big picture. Perhaps your invoices are all stored on your accountant’s desktop, while your sales receipts are on your cashier’s tablet and you keep other key stats on your smart phone. 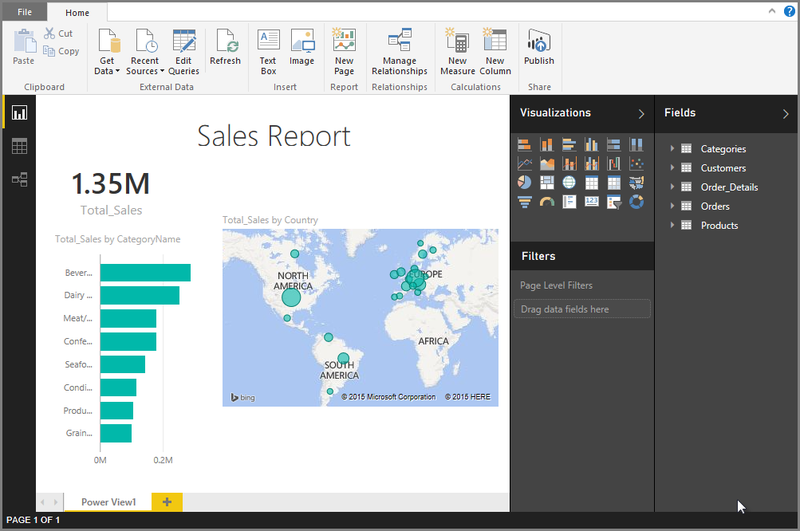 With Power BI’s cloud-based system, you can collect all of this data and view it remotely. This means you’ll leave no stone unturned and truly understand the state of your company’s affairs. Have a discussion with your data. “Ask and ye shall receive,” seems to have been one of Microsoft’s mottos in designing Power BI. Rather than grappling with spreadsheets or spending hours online hunting for the right variables, you can find the answers (and the interactive graphs, charts, maps, and more) you want just by typing your query into the Q&A question box. Keep everyone in the loop. Your colleagues, consultants, and coworkers can all access relevant visualizations and data in the cloud. You can also publish key findings in “content packs” generated by power BI or upload them to your blog or website to share your successes. It’s the “future of Excel.” In her recent CIO Magazine article “Why Power BI is the future of Excel,” Mary Branscombe argues: “Excel isn’t going away, but it’s going to stop accumulating extra tools like barnacles. Instead Power BI Desktop will become the self-service analytics hub.” Getting it now could put you ahead of the curve. It can save you money. By saving you the time and expertise previously required to comb through data sets and craft visualizations, Power BI can help you reduce your costs. Jon – You’re definitely on the right track on process to successfully migrate from Domo to Power BI. Of course, on a much more cost effective basis, as Power BI Pro licenses are $10/month per user. Most likely, you would setup Office 365 licensing with a minority of users as “power users” with admin rights as Power BI Pro users. The rest of your users (outside of Group users) will be Power BI freemium users at no additional cost to view reports and/or dashboards on desktop or tablet/smartphone (via Power BI app). Please note, that Power BI Pro licensing is required if you want to setup such features as Organizational Content Packs, Groups, or Gateways (for refreshing SSAS on-prem data). Also, please note that all RLS (Row Level Security) is setup within Power BI desktop prior to publishing to powerbi.com. Essentially, if you already have Data Models (i.e. SSAS Models), then we can connect those as datasets within Power BI Desktop publishing to powerbi.com or connecting within powerbi.com directly. Alternatively, if you have not yet built the Data Models as Tabular Models, then we can connect to SQL Server directly using Power Query in Excel and build those accordingly (inclusive of any relationships, calculations, measures, KPIs, and hierarchies). This is the best option to retain total control and customization moving forward. Yet, recall that even connecting to SSAS within Excel that all data from an OLAP cube is flattened so the Data Model is rebuilt from the individual SSAS tables. Nonetheless, you can restore the latest completed Excel Data Model from Power Pivot as a fully functioning OLAP cube back to SSAS within SQL Server at any time. As an additional bonus, Excel reporting can be easily setup via ODC (Office Data Connection) based on the powerbi.com dataset connection. Any Excel reporting refresh querying the OLAP cube requires credential authentication otherwise the reporting is completely static as an added security measure. Lastly, we can initially emulate and further customize reports and/or dashboards generated from Domo within powerbi.com to be shared as Organizational Content Packs (allowing users to generate custom reports and/or dashboards) or read-only reports and/or dashboards. We can discuss these options further over a GTM call early next week. My next availability is on Wednesday at 1:00 PM EST so please let me know if that works on your end. Any additional documentation that you can provide prior to our call would be most helpful. P.S. I will once again need Remote Desktop Connection added to the Citrix Receiver apps (still functional) to work remotely throughout the course of the project. Our team of Microsoft maestros can help your business make the most of tools like Power BI. Contact us today to learn more about our services or schedule a consultation.